I love Smash Bros. I love Adventure Time. So how could I not love this crossover art. So what time is it? It’s Super Smash Time! I think my favourites are the BMO MegaMan and the Lumpy Space Kirby. Mind you, these are my two favourite Adventure Time characters generally speaking, so the fact that I like these two best should come as no surprise. WHAT TIME IS IT?! 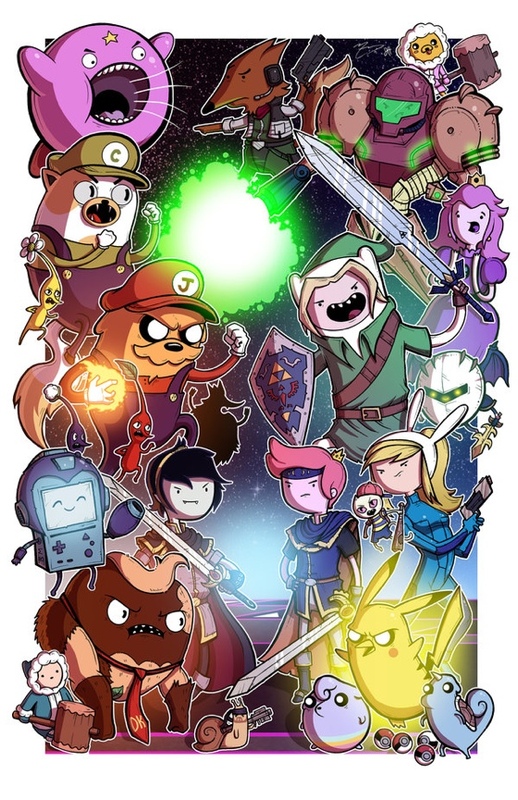 Mike Vasquez was kind enough to ask me to color his AMAZING lineart for this awesome Adventure Time/Super Smash Bros crossover print! I had SO SO SO SO much fun doing it. Thanks to him for thinking of me! Can you name all the crossover characters?! There’s 22 (23 if you count the one character doubled)!